Almost every culture in the world has its own way of grilling meat. But in Argentina, grilling isn't just a way to prepare food, it's an art form. In Gaucho country, a whole meal is easily prepared on an open, wood-fueled fire, from vegetables to dessert. And in a country known for its grilling, chef Francis Mallmann is one of the best-known. He runs a grilling restaurant in Mendoza, Argentina called "1884," and recently authored "Seven Fires," a book about Argentine grilling. 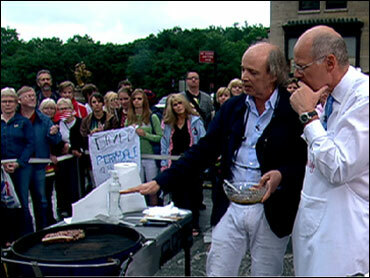 But Mallmann was far from home on Thursday, appearing on The Early Show to show how to bring Argentina to your grill. About an hour before you plan to serve the meat, start a wood fire off to the side of the grill. In Argentina, we use a large iron basket for the fire, with a wide grate that allows the larger coals to drop through so you can easily move them under your cooking grill. Remove the steaks from the fridge or cooler, giving them enough time to come to room temperature. Their temperature will affect the way that heat enters the meat. If it is cold when you put the meat on the grill, you risk toughness. Shovel or rake a 2- to 3-inch bed of coals under the grill grate. This bed should extend for about 3 inches beyond the perimeter of the grill, so that every part of each steak will receive uniform heat. The grill grate should be 3 to 4 inches from the coals. Wait for the coals to cover over with a layer of whitish ash. You can test the temperature by placing your hand almost at the level that the meat will cook. The fire should be medium-high, and it is ready when you can hold your hand there for only 2 1/2 seconds (to determine 2 1/2 seconds, in Spanish, we say, "Uno matador, dos matador, tres..."; the English equivalent is "one Mississippi, two Mississippi, three..."). Keep a spray bottle filled with water handy to douse any flare-ups. Salt the steaks to taste. Using tongs, grease the grill grate with a piece of fat or a clean cloth or paper towel moistened with olive oil or other cooking oil. Place the meat on the grill. You should hear a nice sizzle. Then don't touch the steaks, and don't move them. After 5 minutes, gently lift one edge to check the sear marks on the meat. If they look just right at that point, rotate the meat 90 degrees. This will create a crosshatch pattern and keep the meat from burning where it is in contact with the grill. After 4 more minutes, turn the steaks over and cook for another 7 minutes, or until cooked to medium-rare. As before, check after 5 minutes to make sure the meat doesn't burn where it touches the grill, and rotate the steaks if necessary. Transfer the steaks to a platter and let rest for 3 minutes. Mince the garlic very fine and put in a medium bowl. Mince the parsley and oregano and add to the garlic, along with the red pepper flakes. Whisk in the red wine vinegar and then the olive oil. Whisk in the salmuera. Transfer to a jar with a tight-fitting lid, and keep in refrigerator. Chimichurri is best prepared at least 1 day in advance, so that the flavors have a chance to blend. The chimichurri can be kept refrigerated for up to 2 to 3 weeks. Pour 6 tablespoons of the olive oil into a small bowl and stir in the thyme, oregano, and lemon zest. Let stand for 1 hour. Heat a large cast-iron griddle over high heat. Cut the eggplants and onions in half. Brush the cut sides with the remaining 2 tablespoons olive oil and place cut side down on the griddle. Place the peppers on the griddle. Cook for 2 to 3 minutes, without turning, until well browned. Meanwhile, arrange the arugula on a platter. Top with the vegetables, browned side up. Wipe off the cooking surface. Brush with a little olive oil, and over medium-high heat brown the cheese on one side only, 1 to 2 minutes. Use a wide spatula to transfer the cheese browned side up to the platter, placing it alongside the vegetables. Drizzle with the herb and lemon oil, sprinkle with the chopped olives, and serve while the cheese is hot. For more Argentine recipes, go to Page 2. Lay the meat out on a work surface and trim off all fat and membrane. Using a meat mallet, pound to an even thickness of 3/4 inch. Combine the garlic, rosemary, and 6 tablespoons of the olive oil in a small bowl. Season the pork with salt and pepper to taste, and spread half of the garlic mixture evenly over the surface. Flip the meat, season with salt and pepper, and cover with the remaining garlic mixture. Brush a 12-inch square or two-burner rectangular cast-iron griddle with 1 tablespoon olive oil and heat over medium heat until a drop of water sizzles on the surface. Add the meat to the hot surface and cook until it is well browned and crusty on the peaches around the meat, cut side down. Dot the butter around and in between the peaches and let them cook until nicely charred on the cut side and slightly softened, about 5 minutes. Transfer to a platter and cover to keep warm. Heat a large cast-iron skillet over high heat until a drop of water sizzles on the surface. Meanwhile, cut the tomatoes in half. Brush the cut side of the tomato halves with olive oil and sprinkle with coarse salt to taste. Place the tomatoes cut side down on the hot surface. Do not move for 8 to 10 minutes, or they will burst and lose their shape. The bottoms of the tomatoes will show a thin black line of char all around when they are done. Using a sharp-edged spatula, lift the tomatoes off the hot surface and invert onto a serving plate, so that the burnt side is up. With a chef's knife, cut crosshatches into the surface of the tomatoes. Sprinkle with the peppercorns and oregano, drizzle with more olive oil and serve immediately. Note: I like whole peppercorns here, but if you find them problematic, coarsely crack or grind them.